Eight Ball, at Geoffrey Young Gallery, in Great Barrington. MA. Closes 7/27. Brece Honeycutt.... wearing a cool shirt she made... I think she said she made it by wrapping something really hot/burning(??)... I can't remember, maybe a horseshoe?... but it was an interesting process. Initially I thought it was like a Cai Guo-Qiang gunpowder thing... like he did for Gap... as seen in 'Which Infant Stool Sample?'. Geoffrey Young (L) Michael Dotson (Center) Gary Petersen (R). Somebody remind me who did that yellow piece... it's plastic pepsi bottles or something all flattened and smooshed down, painted over yellow. Vince Contarino!... - I've known Vince for a few years at least but this was the first time to see a selection of his paintings,,,, NICE! Vince Contarino and Nina Smith. Kylie Heidenheimer, at Galerie Gris, in Hudson. Closes 7/15. not sure if he has a website yet, it's a new gallery... at 621 Warren... same street as John Davis! The previous show was Marina Adams.... I missed that show but got some good photos of her work in the back... will post soon. 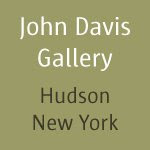 at John Davis Gallery, Hudson NY, through 7/14. Gregory Amenoff - very nice... I liked the big ones especially...they are very Elizabeth Murray. STUDIO CRITICAL interview with Jason Stopa. STUDIO CRITICAL interview with ME! Jon Isherwood - glistening brown... plop... mysterious glyphs... so WEIRD! Gregory Amenoff and Jason Stopa - sorry it's blurry. JJ Manford + a Jason Stopa painting... rainbow and glitter. JJ had a show at John Davis last year. Eric Doeringer, Some Los Angeles Apartments, in Love to Love You, curated by Martha Joseph. MASS MoCA SUMMER 2013!! .... some new shows opened.... a Jason Middlebrook show, a Joseph Montgomery show, and a small group show including Eric Doeringer. Jason Middlebrook's centerpiece... a Falling Water sculpture... kind of an 'awkward space'-filler, his totems/planks are more interesting. MASS MoCA recycles everything... I wouldn't even be surprised if this was Styrofoam left-over from K. Grosse's wonderful show. BEST use of MASS MoCA recycling I have seen yet was the utilization of the the C. Buchel abandoned movie theater seats to watch Guy Ben-Ner's (Buchel mocking) video. Jason Middlebrook... charred-ish... 'plank' pieces are always cool. How/Why. Also, anything that is burned or just looks burned. Judy Chicago's 'plank'-ish piece, Rainbow Picket (1965), included in the 1966 Primary Structures show, came before the first McCracken plank (1966)... he was in Primary Structures also, but it wasn't a plank... was he inspired? I've never read anything. Judy Chicago +... tough ads-as-art in Artforum before Benglis, car hoods on walls before Prince. Eric Doeringer + MASS MoCA's Director Joe Thompson. Eric has what looks like a really good show - or series of shows - this summer at No Foundation, in Toronto. I saw some photos on his facebook... not sure if this link to the fb pic works but try it. Eric's 2009 show at Dam, Stuhltrager was one of those rare perfect shows. MORE TOTEMS!... not planks though, on the wall. Eric with artists working at MASS MoCA. Eric's GF,,, I staged this photo don't be mad! NOTE of DISCORD - i don't live terribly far from this museum... back in 5/2012 i emailed some curators here (Susan Cross, Denise Markonish, +) and at the Tang (Megan Hyde, Rachel Seligman, Ian Berry), inviting them to visit my studio... not a single one responded, even to decline. LAME! !...as non-profit museum 'curated' shows it's kind of sad; the artist's NYC galleries do all the work getting these shows placed. Richard Artschwager, at The National Exemplar. Closes 6/10. National Exemplar is Eneas Capalbo's gallery. Eneas is an artist... I loved his show of fake Condos at Half Gallery. Peter Coffin in the front gallery. Richard Artschwager's last piece... a drum... it was at his bedside.